Home › Uncategorized › THE DUPLICITY, CONFUSION, AND DISOBEDIENCE OF THE BAPTIST CHURCHES…. THE DUPLICITY, CONFUSION, AND DISOBEDIENCE OF THE BAPTIST CHURCHES…. This morning I was thinking about the duplicitous message of the Baptist…. Second, almost all Baptist say Baptism has nothing to do with salvation, that an unbaptized person can go to heaven, after all, “what if he died on the way to his baptism”. — This position of most Baptist that it isn’t necessary for salvation BUT IS NECESSARY for “membership”, meaning full participation and acceptance, and let’s call these “privileges”, by the Baptist church (note: it’s good and brings all of the privileges in all Baptist churches as letter are carried to a new Baptist church should the baptizee move to a new location) is a duplicitous message even for Baptist because how is it that God fully accepts me into His fellowship without the Baptism but the local Baptist church doesn’t until the person is baptized?! This duplicity has led me to the conclusion that by their teaching, it would be harder to be a Baptist than to be a Christian. Of course all of this is wrong. This leads me to the next group. Fourth, some Baptist, a very very confused and liberal brand of this denomination, say that salvation AND acceptance into the church is not necessary at all. This is not something you would discover by going to a Baptist church web-site as the official position will include adult baptism, but the experience says it is so. The message communicated at one such liberal Baptist church in my town is not so strict and legalistic as the “Grace Baptist” that of the American Baptist affiliation (very Calvinistic) and the message I have heard from many people who attend said liberal Baptist church is that no Baptism is pushed at all. Now accepting that a Baptist (the name implies they Baptize) Church no longer requires baptism says these have evolved from their traditional brothers, most likely out of desire for consistency, which is to say that they understand their local membership cannot be more stringent than what they believe are God’s requirements. According to them, faith alone (along with a prayer, wink) is all that’s required to enter into God’s saving grace and therefore how can they place any greater hurdle upon the same people. Well I applaud them for being more consistent than their Baptist brothers who still demand baptism for church membership. However, and here is their problem, they are not Baptist! Also, they are contradicting God, who said, “Make disciplines, baptizing them, and teaching them to observe all that I commanded you”, Mt 28:18-20. I say all of this with love for my friends. I do not intend to hurt anyone. 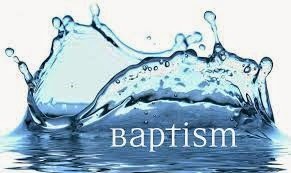 I just pray that all will see what I preach is the Lord’s commands that we must repent and be baptized into Christ for the remission of our sins. At Baptism (not Baptism “in and of itself” as the liars have accused us in the church of Christ as teaching, and their condemnation is just for doing so) there is the saving grace of God that intersects with the obedient faith of the sinner (what, you didn’t know that saving faith is obedient, cf Rom. 1:5; Rom. 16:26; 1 Thess 1:3, 2 Thess 1:11) getting into the water, cf Col. 2:12; Gal. 3:26,27. Salvation from God is only for those whose faith is in Him.